De Stijl [The Style] was a Dutch artistic movement founded in 1917 by the Dutch painter, designer, writer, and critic Theo van Doesburg. The group's principal members were the painters Piet Mondrian, Vilmos Huszár, and Bart van der Leck, and the architects Gerrit Rietveld, Robert van 't Hoff, and J. J. P. Oud. The artistic philosophy that formed a basis for the group's work is known as neoplasticism—the new plastic art (or Nieuwe Beelding in Dutch). 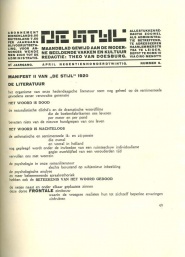 De Stijl: Maandblad voor de moderne beeldende vakken [en kultuur] is the name of a journal that was edited and published by Theo van Doesburg and served to propagate the group's theories. Originally a monthly, later published irregularly, De Stijl appeared in 90 issues between October 1917 and January 1932 in Delft (1917-18), Leiden (1918-21) and Meudon (France); not published in November-December 1920, January-February 1923, and 1929-1931. Though the journal never sold more than 300 copies, it had a strong influence on art in the Netherlands and abroad. 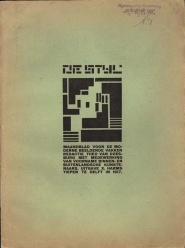 De Stijl 1:1 (October 1917). De Stijl 3:6 (April 1920). Digitale bibliotheek Nederlandse letteren hosts a HTML version of the 1968 reprint: Volumes 1-3 (1917-20) and Volume 4 through Dernier Numero (1921-32). Iowa Digital Library and International Dada Archive have JPG and PDF pages of Volumes 1-3 and Number 4:11. UbuWeb hosts the PDF issues of Volumes 1-3. Reprint: 2 vols., Amsterdam: Athenaeum, Polak & Van Gennep, and The Hague: Bert Bakker, 1968. Hans Jaffé, De Stijl, New York: Abrams, 1970. An extensive anthology of selections. in Form, Dec 1967 and Mar 1968, Cambridge. F. Bach-Dandrieú, J. Sprenkels-ten Horn, Index op de stijl / Index of De Stijl, Amsterdam, 1983. This page has been accessed 26,833 times.